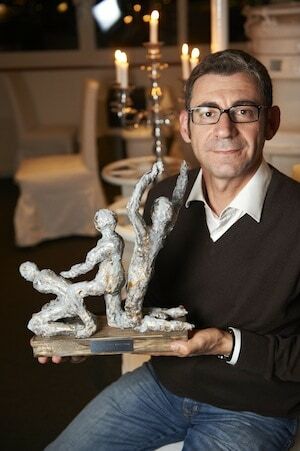 The Scandinavian Human Rights Committee has chosen to honour Mr Luca Volontè for his promotion and encouraging of the effective exercising of the human rights and freedoms by granting him the Scandinavian Human Dignity Award 2011. The Award was granted to Mr Volonté at a celebratory dinner in Stockholm at the 18th of October, after Mr Volonté had been one of the keynote speakers at a Parliamentary Seminar at the Swedish Parliament. The Scandinavian Human Dignity Award is presented to a person who has made a special contribution to human rights, all of which derive from the inherent dignity of the human person and are essential for his free and full development. The Scandinavian Human Rights Committee finds that Mr Volonté has encouraged actions to overcome discrimination and infringements of human rights in Europe and has promoted a greater understanding of and respect for human dignity. His long time commitment for human dignity and astonishing efforts in the Parliamentary Assembly of the Council of Europe make Volontè worthy of the Scandinavian Human Dignity Award 2011. Presentation of Mr Volonté Mr Luca Volontè holds a degree in political science and is former leader of the Italian Movement of Communion and Liberation. He was elected to the Italian Chamber of Deputies in 1996 and reelected to the Italian parliament in 2001. Volontè was re-elected for the third time in 2006 and elected to the Chamber of Deputies in the XII , XIV , XV and XVI legislature. In the XV Legislature Volontè was elected member of the Social Affairs Committee and the Committee on the Rules. Mr Volontè is the President of the EPP group in the Parliamentary Assembly of the Council of Europé. He is a member of the Presidential Commettee, the Monitoring Committee, the Political Committee of Social Affairs and Family Committee in Strasbourg.